I said it elsewhere, but it bears repeating. Why did they even bother? NECA's has almost the same accessories, looks way better, and costs a fraction of the price. I love Jason and this is a decent-looking figure, but what these guys said...I'll stick with my NECA Ultimate Part 3 figure. At $80 Mezco priced themselves right out of the competition. My biggest issue with this one is the cloth outfit. It's way too clean looking and the fabric used on the shirt looks too bulky for the look they're going for. I'm usually able to look past that on a NECA Mego, because those are only $25 - $30 compared to $80. It's odd, the cloth on their Frankenstein is perfect, but they seemed to have regressed here. Nice figure,but as everyone just stated. I am a Neca guy. Another thing that caught my eye is the change in skin colour from hand/ wrist to forearm. It's very noticeable with his arms straight down. I can't imagine how awful it will look with his arms up or bent. Yeah, that too. Besides, it's easier to overlook the clothing on the Mego figures because NECA is clearly taking a slight tongue-in-cheek approach with their designs...the figures are detailed and screen-accurate, yes, but they're also supposed to look a tiny bit cheesy as a homage to 70's toys, and NECA struck the right balance when it comes to that. That's NOT what Mezco is going for...this is supposed to be a legit serious figure and the approach they took cheapened it. Add in the price differences, and yeah...NECA wins all the way. I get what everybody is saying, no doubt. However, I like the removable masks, detailed accessories, and the fact that he’s 6” scale. 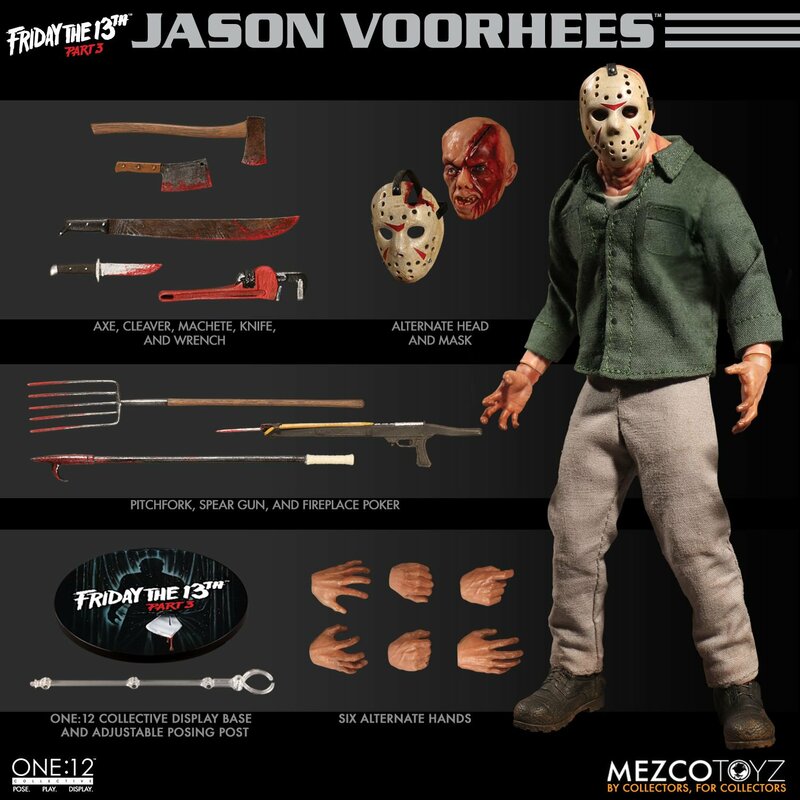 After preordering the Michael Myers, I needed to get another slasher in Mezco’s One:12 line. The clothes could use some reworking, and I wish the eye holes in the mask were more accurate. Keep in mind, once he sells out, the price really goes up. I’m with you, man. I’m a completist when it comes to Jason stuff, so I was always in on this...but I think the final product turned out better than initially expected. One:12 always look better in hand than they do in photos. The accessories are well done and plentiful, with one of the most accurate Part 3 headsculpts I’ve seen on a figure. Plus, it will be extremely poseable...from the looks of it, you’ll be able to recreate every kill from Part 3, including the eye-popping head crush. I agree that the eye holes on the mask are a bit disappointing. I’d love for them to rework it a bit to be more accurate. No one has gotten the shape or details exactly right on the Part 3 mask on an action figure. The head sculpts really do look good! He had a very clean looking bald head, Mezco did that well. Yeah the eye holes bug me, not even close to accurate. NECA’s Ultimate part 3 has the best mask on a part 3 figure IMO. They are more round, which isn’t 100% accurate, but I’ll take that over this shape. Worst comes to worst, I don't like it in hand, and it hits the aftermarket. Either way, I'll get my money's worth. Gguuuuaaaggghhhhhh....I might be re-considering as well, because I'm such a Jason completist as well and the fact that, at 6 inches, I might be able to take some fun pics of him with my Marvel Legends stuff. We'll see. Why is there alyways Jason in his Part III Outfits. in his Freddy VS Jason outfit. Or even better: JasonX Version. But i also hope, that someday Mezco will create an Freddy Krueger Figure also.